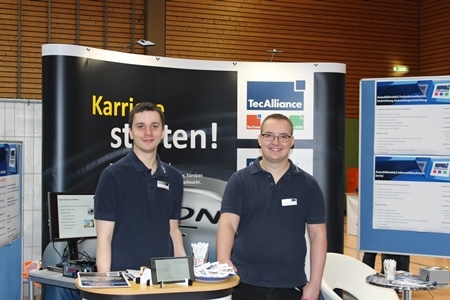 On 7 March and am 13/14 March 2015 TecAlliance presented itself as a training company at the education trade shows in Schrozberg and Weikersheim, Germany. At the new stand designed especially for recruiting exhibitions interested young people also could read the new training brochure. The appearance at the two training exhibitions was planned by the current TecAlliance trainees: They organised putting up and taking down the stand; during the exhibition they also manned it to present the company and win new trainees for TecAlliance. 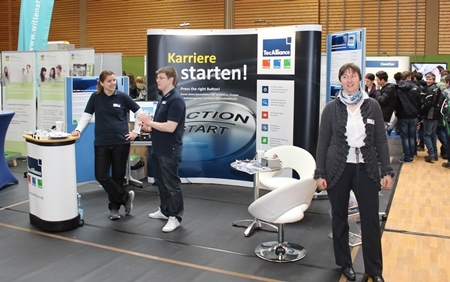 TecAlliance trainees Isabel Peter (left) and Paul Hensinger with training manager Kerstin Langohr at the stand in Weikersheim, Germany. Information about the training professions is available at the TecAlliance website where also the training brochure can be downloaded. 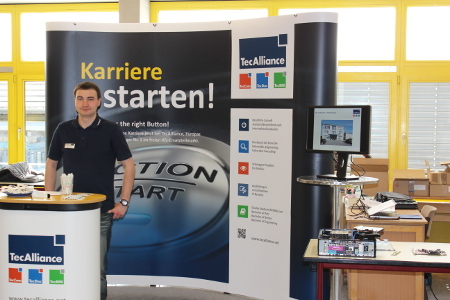 Rudi Heinrich, trainee at TecAlliance, at the stand in Schrozberg, Germany.